Margaret Mitchell's Gone with the Wind is saturated with the aspiration of the courage of the human beings who knew in their memories and blood there is something to be achieved. It is an aspiration that makes human beings a complete Flame that grows forever. The power of social evolution the book carries was so vast and intense that it sold ten million copies. In the first three days of its publication the book sold 176,000 copies. This is the nascent Power of social evolution. Rhett Butler and Scarlett O'Hara, the lead characters, embody that fire which is there dormant in us all, but we are unable to express it for want of the psychological infrastructure or because of the too great a value we attach to social values and personal compunctions. The hero and heroine were fully devoid of these outer restraints and inner inhibitions. When unimpeded by social inhibitions, human personality expands like the energy of these people and discards social values as they do. That is why these characters have captured the imagination of readers and live there so long with life. Their pursuit of results is relentless. All who have achieved results pursue them in this relentless manner. In these people it looks brazen, shameless, wicked, and mercenary. Any one who has ever attained results attained them by refusing to taint it with social consciousness or psychological conscience. Not all people do what they do, but the essence is the same, only the expression differs. They defy those barriers but behave as if they cared for them. Results in any act are achieved only like this, especially immensely huge results. What succeeded for Scarlett was not her ideas, ambitions, plans, but her nascent energy that was devoid of scruples. What worked for Rhett was not his masterful adjustments with the need of the hour or his money, but it was courage, energy, generosity and the dedicated pursuit of Scarlett whose energy he was attracted by. More so, her refusal of him was the greatest spur. A protagonist. Willful Southern belle. Scarlett inherits energy and aspiration from her father. Her outward manners are what have been imposed on her by her mother and the strict discipline of Mammy. Scarlett, like her father, was driven by the experience of poverty and her vow to escape it and shared his direct approach to getting whatever he set his eyes on. He had not scrupled to risk the capital of his brothers' firm in gambling to win Tara. She combined her mother's beauty and her father's energy and spark. Scarlett is confronted with one physical threat and crisis after another. Why do they come to her and how does life respond to the way she meets them? The crises come to everyone in Georgia because the society is undergoing a violent revolutionary change that is throwing out the old and ushering in new ways. The young men respond to the threat by dying bravely. The women bravely accept tragedy and give their full support. Scarlett has no man to protect her and none to support. She and Melanie are thrown on their own resources. The situation calls forth the latent energy, strength and courage that are part of her nature acquired from her father. Those resources enable her to survive the crisis as others do in their own way. Where Scarlett differs from those around her is that she does so by rejecting the cultural and human values she learned from her mother. She descends to physical values of selfishness for survival, rejecting the social values of conformity and respectability which were so essential to the old culture. She is the second generation poor seeking to establish itself in a new world, the others were old established families. Her aid to Melanie in child birth and her single-minded will that provides support to the whole family at Tara bring much needed aid at critical junctures from Rhett, her generous neighbors, and even the enemy soldier who comes to rob them bringing money with him and getting killed and robbed for his attempt. Beyond her valour and self-sacrifice, Scarlett also betrays the trust and values of the community. Her only values are the values of physical survival and later social success and her illusory dream love of Ashley, which gives her something to believe in while the world is crumbling around her. She marries Charles for revenge. She steals Kennedy from Suellen who becomes her enemy. Her deceit to Kennedy and betrayal of Suellen saves Tara, but alienates her from the whole community. Scarlette's determination to save Tara, whatever the costs or the sacrifice (even if it means becoming Rhett's mistress), is an example of the power of commitment in life. She has no idea how to save it, but her determination is 100%. Commitment first, knowledge after. It is not as if she was committed because she knew how to save it. The will creates the way (opportunity), not vice versa. That commitment receives the generous response of food from her neighbor; attracts the Yankee thief, which brings money; brings the proposal from Kennedy. She was unscrupulous, ruthless, false to the core, but she always remained true to her commitment. Life rewarded her according to her character, but it always respected that strength of her commitment. 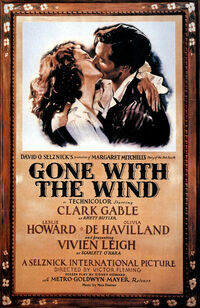 Scarlett's determination to save the land is a continuation of Gerald's to become a plantation owner. It expresses the subconscious aspiration of the family to rise socially and hold on to what it has acquired at any cost. It is not the property she clung to but the social elevation Gerald had achieved. To lose Tara is to lose all her father had gained. That is why she feels a desperation that others do not. Other families feel their whole civilization is crumbling, but she is not part of that civilization. She is closer in affinity to the Yankee families that become the newly rich of Atlanta. It is that same intensity of aspiration that expresses in Scarlett's love for Ashley. What she really wants is the social elevation of marriage to one of the oldest, most cultured families in Georgia, though Ashley's culture is inimical to everything she is. She is enamored of the next level in society, not Ashley the person. Marrying Ashley is to cement the gains Gerald achieved in marrying Ellen. In reality, the gap between Georgia culture and Irish peasantry was too great. Gerald only succeeded in marrying a disappointed lover, with the emotions of a widow whose lover had died. It was outwardly legitimate, but inwardly a non-starter. Ashley had no such compulsion to renounce family and culture and even his attraction to Scarlett's energy is an expression of the weakness and degeneration of that culture, as Darcy's attraction to Elizabeth in Jane Austen's Pride & Prejudice. Her unscrupulous business practices and employment of the convicts earn money. She sacrifices all social respectability and support and is eventually abandoned by everyone including Rhett after Melanie's death. It was Melanie's gratitude for Scarlett's earlier efforts and Rhett's commitment to her that had protected her all these years-not her own unscrupulous efforts. Good acts and some inherent positive qualities brought support from life, not her desperate, unscrupulous selfishness. The values of the old world are genuine, based on inner reverence of culture, like the Indian Brahmins worshipping the tradition, but it was out of tune with the march of times. It is a rewarding experience to read of their devotion to values, their inability to receive help from people they socially disapprove of, and truthfulness in their personal lives. Scarlett who was devoid of any of these values thrives by her courage and mercenary attitudes. Scarlett's love interest and third husband, often publicly shunned for scandalous behavior, sometimes accepted for his charm. Rhett made money in the blockade. He was not received anywhere. After Bonnie was born, he won them all over so that his child would not be ostracized. That money will not give this child a glorious life. He was a strong man in the extreme. His money was made out of courageous risk. Had he been not so strong, having shifted to the other side he would have lost his money. The weakest link in his chain of life was the child, as her mother never wanted her, and she was jealous of Bonnie. Atlanta switched over to him for the sake of Bonnie but regretted it. Life did not give the sanction to that child. He had the courage and energy of an adventurer. He had the joy of accomplishment against great odds and it gave him wealth, but he could never get the love of Scarlett and his affection for Scarlett died with when Bonnie died. It was not love of Scarlett but a seeking for a woman who was unattainable. Had he really loved Scarlett he could not have denied her money or asked for security when she came to him in jail to get tax money for Tara. He wanted to refuse her as she has refused his love. Then immediately after getting released from jail, he went to her. He is attracted to Scarlett because she is unattainable. It is romantic attraction to her energy, courage and even her irascible unscrupulousness, but it is not love. The society they lived in did not accept them or their behaviors and did not sanction happiness to them in its midst. Rhett had extraordinary strength in the physical and an equally great strength of mind. Strength when it is positive expresses as generosity. He was generous to a fault. Ashley's wife, Scarlett's sister-in-law, a true lady. Called "mealy-mouth" by Scarlett, but she quietly has a backbone of steel. Melanie's purity is more than the cloistered virtue of Ashley. It had the touch of spiritual purity that never sees evil. To her Rhett's money will not do any good, maybe it would take her life. Melanie is pure goodness. It will thrive in an atmosphere of pure goodness. The value of the Southerners was real in earlier times, not then. It was against the spirit of Times. It upheld slavery. Great cultural values reared in an artificial context lose life. Melanie had to put up an appearance. She had to support Scarlett whose values were at loggerheads with hers. It is characteristic that no Southerner even prospered after the war. The post war era could not support Melanie's life. The man Scarlett loves, Melanie's husband, a dreamer and a gentleman. Gerald had the aspiration to rise socially, escaping poverty in Ireland for adventure in the new world. He risked his brothers' capital and won Tara in a game of chance, where subtle forces could express directly, the power of his aspiration, which was far more intense than the almost indifferent attitude of the previous owner who was disillusioned with Tara and anxious to get it off his hands. Gerald had two marked traits: Whatever he set his mind on he achieved. He did not feel inferior to anyone. No one could tell him something was too good for him, either Tara or Ellen or anything else. That self-confidence, mental faith, enabled him to accomplish. Gerald's deep love of Tara which Scarlett shares are powerful enough to exempt it from destruction where other homes were ruthlessly destroyed. Scarlett's mother, who belonged to one of the wealthiest aristocratic families in Georgia, was in love with an aristocratic cousin who was sent away by the family and killed in a bar brawl and forever took the spark of joy and life from her. After that when Gerald, a coarse but good commoner who acquired his wealth by gambling, proposed, she accepted and lived the rest of her life without emotional fulfillment. Scarlett repeats her mother's act of falling in love with aristocratic Ashley and never being able to fulfill that emotion, but instead marrying a coarse but essentially good commoner who acquired his wealth by gambling and speculation, Rhett. Scarlett's nurse from birth; a slave. Cited by Rhett as "the real head of the household." The slaves existence is sub-physical. They lack independence of consciousness and physical action. When they offer loyalty to their master, they elevate themselves to vitality which is a treasure for them. They do not give up. Mammy is one such. Rhett called her the head of his family. Mammy leaves Scarlett as she sensed the last traces of the family had disappeared. Rhett's is not love of Scarlett. It is a powerful vital response of seeking to possess what eludes a man. Hers was NOT love of Ashley but a seeking for all the values he stood for. It is a truism of the man-woman relationship that the man who seeks psychological fulfillment in the woman must always be rejected in the depths by the woman he is after. The moment she does want him really and expresses it foolishly, he will leave her instantaneously. Butler leaves her the moment she wants him - it is a wanting, not love. She is entirely without scruples or regard for convention. Her strength is unmatched, physical as well as psychological. This attracts him and he could not tolerate her eluding him. She is downright practical and sensible when it comes to doing a work by itself, not in terms of society, but by itself as a work. That represents the human faculty which built the USA. In its pursuit pure courage emerges and conventions, formalities, moralities, forms, etc. are thrown to the winds. It is a pursuit for its own sake aiming at the result devoid of trappings of any description. The energy released is nascent, the pursuit is pure, rather naked, the aim is the result. Scarlett as well as Rhett secured the results they pursued in abundance. What he could not acquire is her love or care. Nor could she interest Ashley in her. Both were outside the line that released this energy. Hers was a cultural aim, his was a psychological dream. Neither had the social sanction or their own inner endorsement, inner in the sense of not desire but the centre that made them powerful. When Scarlett corners Ashley in an effort to get him to propose and elope, Rhett accidentally witnesses the whole conversation. What brought Rhett there just at that time to witness this scene? Ashley is never meant for Scarlett, Rhett is. In their very first meeting, her character is fully exposed to Rhett. Rhett is attracted to the irascible energy in Scarlet. Life brings them together. At the moment she seeks fulfillment in Ashley and decides to act to get it, life brings Rhett who is the only one who has to the strength and understanding to ever possibly give her fulfillment, yet she is only embarrassed and angry at him. Rhett and Scarlett have a lot apparently in common, as Rhett frequently remarks. Both are strong, courageous and unscrupulous. What brings them together? Scarlett is beautiful on the surface and for long maintains some semblance of goodness in her behavior though inside she is wild, raw, jealous and ruthless. Rhett makes no pretense of goodness and seems to revel in renouncing all semblance of goodness, yet inside he has a strong streak of goodness and self-sacrifice which express in his joining the Confederate army at the end of the war, his affectionate attachment to Bonnie and his great admiration for the goodness in Melanie. They are complements. Scarlett has strength and courage but is false and without a strain of goodness or generosity. Melanie is mild, weak and fearful but good to the core, loving and absolutely true. Melanie takes initiative to insist that Ashley kiss Scarlett at their wedding and she invites Scarlett to live in Atlanta after Charles has died. Scarlett's motive for going is boredom. Scarlett's courage and strength save Melanie's and Beau's lives at childbirth, in the escape from Atlanta and in the harsh coming months of starvation when Melanie is too weak to even walk. When Ashley returns from the war, lifeless, purposeless and skill-less, Scarlett gives him a place to live and work on Tara and later gives him a job in the lumber mill. Melanie defends Scarlett even on the night Honey Wilkes abuses her and on every occasion thereafter, befriending and sticking with her when all the Southerners in Atlanta have turned against. Only when Melanie dies, does Scarlett realize how much she drew on support from Melanie for her existence. Melanie's goodwill and affection have supported Scarlett for years but Scarlett never realized it till it was gone and her life collapsed around her, with Rhett's immediate departure. Rhett too seems to have been bound to her by his great admiration for Melanie. Charles is Melanie's brother, Scarlett's first husband .A shy man. At the party, Honey Wilkes tells Melanie that Scarlett's behavior with the men is "fast". Scarlett overhears it and her bragging that she and Charles are all but engaged. She went on to tell Melanie that Scarlett is really in love with Ashley. Scarlett felt furious and humiliated, and would never forgive Honey. The next moment she runs accidentally into Charles who informs her that Lincoln is calling up volunteer troops, which means war. She thinks marrying Charles is a way to take quick vengeance on Honey and also his sister Melanie, and also to show Ashley she does not really care for him, so she gets Charles to propose. Scarlett is one who only takes from others in her utter selfishness. As a wife she can only drain the energy of her husband. He dies within two months of their marriage. Where Melanie's goodness, self-giving and affection for Ashley protect him through the war, Charles falls in the very first year from measles and pneumonia, not even having seen battle. Perhaps, subconsciously he knew he has married wrongly and it kills him. Marrying Charles is her first major initiative in life and its immediate consequence is to plunge her into widowhood, a condition totally antithetical to her gregarious nature that craves attention, excitement and display. From fledgling beauty craving exposure she is condemned by society to premature old age and retirement which she finds absolutely intolerable at the age of 16. It is a universal truth of life that with rare exceptions people who help others are hurt by the people they help. The ego of those who receive help feel the humiliation of being dependent on others for their support. That ego seeks to overcome the sense of humiliation by pulling down the person who condescended to help them. Scarlett tried to help the convicts by asking the mill manager to give them more food. Immediately on her return she is attacked by poor slum dwellers and only saved by Sam's timely intervention. She has provoked and abused the mill manager, who is in a position of strength. His anger falls on her. Helping the undeserving convicts brings on the attack. Because her intention was good (loyalty to the values her mother taught her), her former field slave Sam comes in time to save her out of his loyalty to her. Kennedy was killed. The values of the Old Guard are valuable, but are lifeless as they are outside the stream of social evolution.